Spinal cord injury can be one of the most life-altering types of trauma a person can experience. When people suffer spinal cord injuries, they have damage to the nerves of their spinal cord. Frequently, people who have spinal cord injuries will have their lives permanently altered. The spinal cord is protected by the vertebral column, which are the bones that surround the spinal cord. How hard the impact is on the vertebrae will determine the severity of the injury. The most severe spinal cord injury occurs when the spinal cord is severed. When the spinal cord is injured, it may permanently affect the ability of the person to do normal, everyday activities. This may include breathing, walking, moving and feeling. People who suffer from spinal cord injuries may lose their ability to do one or all of these things. The spinal cord is a bundle of nerves that are covered by a sheath of myelin and 32 butterfly-shaped bones called the vertebrae. The vertebral column is divided into five distinct regions. The cervical spinal region is made up of the first eight vertebrae beginning in the neck and moving down. The vertebrae are numbered beginning at the top and moving down, so the cervical vertebrae are numbered as C1 through C8. The top of the cervical spine is where the brain and spinal cord meet. Injuries to the cervical vertebrae or cervical discs most commonly occur when the head is violently jolted back and forth such as in a rear end car crash, a traumatic fall or some similar type of trauma. The middle portion of the spine is called the thoracic spine. It is made up of 12 vertebrae that are numbered as T1 through T12. While thoracic fractures or disc herniations are much less common than cervical or lumbar injuries, they can cause serious issues including pain radiating through the body up to and including paralysis. The lower area of your spine where it begins to bend is called the lumbar region. This portion is made up of five vertebrae that are numbered as L1 through L5. Lumbar spinal injuries are common following a fall or auto accident. Oftentimes, as we grow older, our lower back begins to degenerate, which makes this lower portion of the spinal column more susceptible to injury following trauma. Most common are disc herniations, which can cause pain and numbness than can radiate down the buttocks, legs and even feet due to impingement of the nerves that travel down our lower body. This is most commonly referred to as “sciatic” pain or “sciatica”. The sacral spine is shaped like a triangle. It is the lowest area of the spinal column, and it bends outward. It is made up of five vertebrae. The spinal cord is not present in this area. Instead, these bones protect the nerve roots that exit the spinal cord. Also called the tailbone or coccygeal region, the coccyx is a single vertebra that is at the very base of the vertebral column. The most common cause of injury in this area is a hard fall or blow to the tailbone from a fall or other traumatic event. The type of spinal cord injury a person might suffer depends on the force of the blow to the vertebral column and the area of the column and cord that is struck. 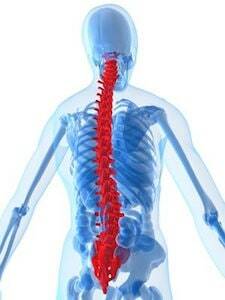 The various spinal cord injuries are divided into two main categories called incomplete and complete injuries. When a person suffers from incomplete spinal cord injuries, the spinal cord is not completely severed. Since a portion of the cord remains together, the person still maintains some function. How much function the person retains and his or her ability to recover will depend on the injury’s severity. When a person suffers from complete spinal cord injuries, his or her spinal cord is completely severed. An injury of this type halts functioning. It is possible to regain some function with therapy and treatment. The complete spinal cord injuries include tetraplegia, quadriplegia and triplegia. With tetraplegia, a person loses functioning and the ability to fill in all four of his or her limbs. The sufferer loses the ability to feel below the site of the injury. The higher up on the spinal column that the complete injury occurs, the more severe the person’s resulting condition will be. Quadriplegia may result in a loss of bladder function and problems with breathing, among other issues. Triplegia is when a person loses the ability to feel in one arm as well as in both of his or her legs. A person who suffers from quadriplegia loses the ability to feel in both of his or her legs. The incomplete spinal cord injuries include anterior cord syndrome, in which the front portion of the person’s spine is injured. If you suffer from this injury type, you’ll still be able to feel, but you will have difficulty with movement. Central cord syndrome occurs when a person’s central area of the spine is damaged. This may result in arm paralysis and a partial loss of function in the legs. It may also result in a loss of fine motor skills. The final incomplete spinal cord injury category is Brown-Sequard syndrome. With this injury, one side of the spinal cord is injured. The degree of injury will vary, and it may involve the complete loss of function on the affected side. In addition to these more serious injury types, people may also suffer from other injuries. These include herniated discs, impinged nerves and disc compressions. What are Some of the More Common Causes of Spinal Cord Injury? The most common cause of spinal cord injury is auto accidents. In fact, statistics show that each year, 50% of new spinal cord injuries are from auto accidents. Although rare, acts of violence (such as gunshot wounds) can be the result. For victims over the age of 65, slips and falls are a common cause of spinal cord injuries. Infections, cancer, spinal cord inflammation, arthritis and other diseases are also some causes. Finally, playing certain sports can result in serious consequences, such as spinal cord injury. What are Some of the Consequences of Sustaining Trauma to the Vertebral Column? Loss of feeling and numbness are on the less catastrophic ends of the spectrum of trauma induced back injuries. On the far end, the results can be complete or partial paralysis such as paraplegia (loss of the use of two limbs) or quadriplegia (loss of the use of all function in arms and legs). In addition to these permanent disabilities, spinal nerve afflictions can result in a number of other problems as well. For example, many spinal cord injury sufferers experience anxiety disorders, phobias, and Post Traumatic Stress Disorder. Others experience intense pain, loss of bladder control, and infertility. Our lawyers in California can help to determine if your spinal cord injury was the fault of another. Oftentimes, after a traumatic event such as a motorcycle, bicycle, pedestrian or motor vehicle accident, the victim can experience back pain, numbness and other symptoms of a spine injury. Oftentimes, emergency rooms simply take X-rays of the area which seems to be in pain at the time emergency medical treatment is rendered. The problem is that X-rays can only detect “hard tissue” injuries (i.e. fractures of bones). If the symptoms persist, it is always prudent to seek out follow up consultation with a medical specialist such as an Orthopedic Doctor or Neurosurgeon. Most often additional radiographic studies like magnetic resonance imaging (MRI) or computerized tomography (CT) scans can reveal “soft tissue” injuries like discs that are out of place causing pressure on the nerves in and around the spinal cord. What Happens When the Potential Consequences of Spine Trauma are Ignored? If a person suffers trauma to the spine but fails to go to the doctor, he or she may end up suffering some negative consequences. They may experience worsened damage to the nerves and may end up suffering from paralysis. It is highly important for people to seek immediate medical attention whenever they have suffered an injury to their vertebral columns. Why is it Important to Consult an Attorney After a Traumatic Event Causing Spinal Compression or Nerve Damage? When you suffer from an injury to your back, your life may be permanently altered. If your spinal injury resulted from a catastrophic event, it is important to determine what happened so that you might be able to recover monetary damages. In many cases, spinal cord injuries are caused by the actions of others. Motor vehicle accidents caused by negligent drivers, slip or trip and falls due to dangerous conditions on private or public property, assaults caused by negligent security, and many other same or similar incidents may entitle a person to monetary compensation due to tortious or wrongful acts for which another party may be legally responsible. An experienced personal injury attorney who is familiar with spine injury claims can determine liability and pursue the maximum recovery amount for those who are injured at the hands of others. While money can never replace the pain and suffering caused by back injuries, it can certainly ease the burden of present and future medical costs and other damages associated with the loss of spine function or the pain of spinal injury related conditions.